ABC has renewed its new game shows Match Game and To Tell the Truth for their second seasons. Anthony Anderson returns to host To Tell the Truth, season two. The show premieres on January 1, 2017. Season two of Match Game, hosted by Alec Baldwin, kicks off on January 4th. Get the details from this ABC press release. Alec Baldwin and Anthony Anderson are returning for new episodes of their successful game shows, both produced by FremantleMedia North America, “Match Game” and “To Tell the Truth.” This summer’s game-show darlings are warming up winter with an expanded list of celebrity guest panelists. The new episodes of “Match Game” begin on January 4, 2017, and “To Tell the Truth” on January 1, 2017. It’s bawdy, it’s irreverent and it’s back! “Match Game” returns for season two on WEDNESDAY, JANUARY 4 (10:00–11:00 p.m. EST), with Golden Globe and Emmy Award-winning actor Alec Baldwin. Produced by FremantleMedia North America, “Match Game” features four contestants each week vying for the chance to win $25,000, as they attempt to match the answers of six celebrities in a game of fill-in-the-missing-blank. “Match Game” averaged 6.0 million Total Viewers and a 1.3/5 in Adults 18-49 during its run last summer. “Match Game” ranked No. 1 in its time period among Adults 18-49 and Total Viewers, standing as ABC’s biggest summertime program in the hour in 10 years – since 2006. On its premiere, “Match Game” debuted with ABC’s largest summer audience in the time slot with regular programming in nearly 10 years and tied the Net’s highest young adult rating in 4 years – since 8/20/06 and 7/15/12, respectively. Two-time Emmy Award-nominee Anthony Anderson is back to host a second season of ABC’s hit series “To Tell the Truth,” premiering SUNDAY, JANUARY 1 (9:00–10:00 p.m. EST), and then on SUNDAYS from 8:00–10:00 p.m. EST, on the ABC Television Network. Produced by FremantleMedia North America, “To Tell the Truth” is a clever and funny re-imagination of the beloved game show of the same name. In its second season the show will feature a new celebrity panel for each episode. In each round, the celebrity panel is presented with three people who all claim to be the same person with the same incredible talent, job or achievement. One is sworn to tell the truth while the others are not. Anderson’s mother, Doris, is also part of the fun, returning as a commentator and bringing their playful family dynamic to the stage . 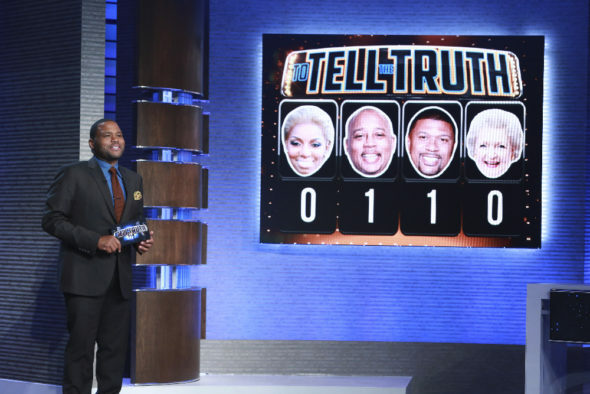 “To Tell the Truth” averaged 5.2 million Total Viewers and a 1.2/4 in Adults 18-49 during its run, improving its hour for ABC by 82% in Total Viewers and by 50% in Adults 18-49. On its series premiere, “To Tell the Truth” delivered ABC’s best summertime numbers with series programming in the hour in 3 years with Total Viewers and in 2 years with Adults 18-49 – since 5/28/13 and 6/24/14, respectively. What do you think? Do you watch Match Game and To Tell the Truth? Will you watch the second seasons of these updated game shows? More about: ABC TV shows: canceled or renewed?, Match Game (2016), Match Game (2016): canceled or renewed?, To Tell the Truth (2016), To Tell the Truth (2016): canceled or renewed?